High-frequency Welding and High-frequency Straight Seam Welding - ZhangYun Machinery Manufacturing Co.,Ltd. So far, Zhang Yun has approximately 20 years experiences to strive for the production of transportation equipment with high quality and reasonable price. In 2006, we began to turn to non-standard equipment R & D, and manufacturing and sales. Our products consist of cold-formed equipment, high-frequency welded pipe equipment, elevator guide auxiliary processing equipment, non-standard automatic production line, etc. 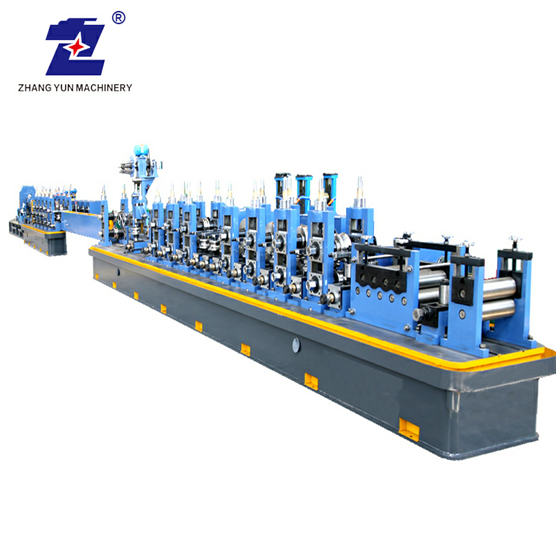 Roll forming line is our main product. The production line is highly integrated by uncoiling, leveling, forming, cutting off, punching, receiving and related process. The whole process is controlled by PCL program. Operators can select a preset program to run the whole line automatically by using touch screen. The methods of operation include automatic control, manual control, separate operation, and emergency stop. In the developing countries, cold-formed steel products are widely applied in construction in which the amount of cold-formed rectangular tubes accounts for more than 50%. The best combination of cold-form steel and H-shaped steel in the construction industry will realize the industrialization of industrial plants and residential houses. High-frequency welding is used in the production of steel welded pipes. It has larger power supply, and higher speed can be achieved for welding steel pipes with different material, caliber and wall thickness. High-frequency straight seam welding line is the specialized equipment to produce straight seam welded aluminum with high frequency or pipes made of alloys of aluminum used as auto condenser pipes, structural pipes and industrial pipes. Through optimized design, there are better materials to choose, and accurate fabrication and rollers. The whole line can be reached high precision and high speed. Moreover, pipe production speed can be adjusted within an appropriate range of its diameter and wall thickness. Are you interested in the product introduced today? If you have any doubt, please feel no hesitation to contact us.